Following on from my last post, and Nick’s comment that if you already have a primer collection, its not really practical to re-type them all into MacVector, one-by-one, here’s a useful tip to simplify that process. We have a utility called PrimerConverter.app that you can download from our website. You do need to be using OS X 10.5 or later for this to run. With most web browsers, the file will automatically “unzip” when you download it. While you can run PrimerConverter.app from any location on your computer, you might want to move it to your /Applications/ folder where you should ideally keep all of your executable programs. 1) The Allow up to X mismatches… popup menu in PrimerConverter can be used to set the number of mismatches permitted for every primer in the file. 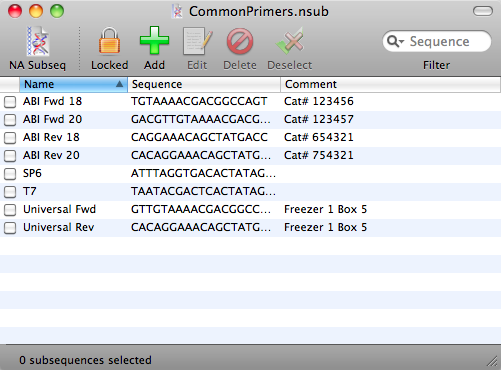 I usually set this to 2 or 3 so that close matches or SNP mutagenesis sites will be picked up in the search. PrimerConverter will create a file where the lower case residues are treated as “must match” residues. You can also do the opposite and have most of the residues in lower case so that PrimerConverter will treat only the upper case characters as the “must match” residues. 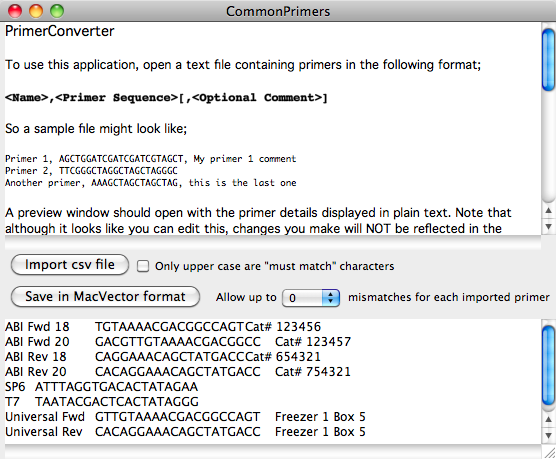 PrimerConverter assumes that the the least common case is the one marking the “must match” residues. You can override this by selecting the Only upper case are “must match” characters if you want more than half the characters to me “must match” residues. This entry was posted in 101 Tips and tagged pcr, primer3, subsequences. Bookmark the permalink. Both comments and trackbacks are currently closed.